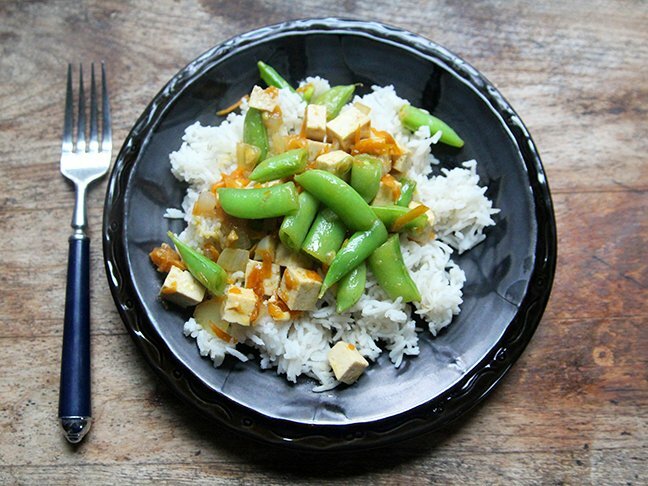 A tofu stir-fry that’s a kid favorite! Whenever my kids and I go out for sushi or hibachi, my daughter gets very excited for the miso soup that comes with our meal. She adores the soup and especially the bits of tofu found inside it. Yes, the tofu. Go figure. 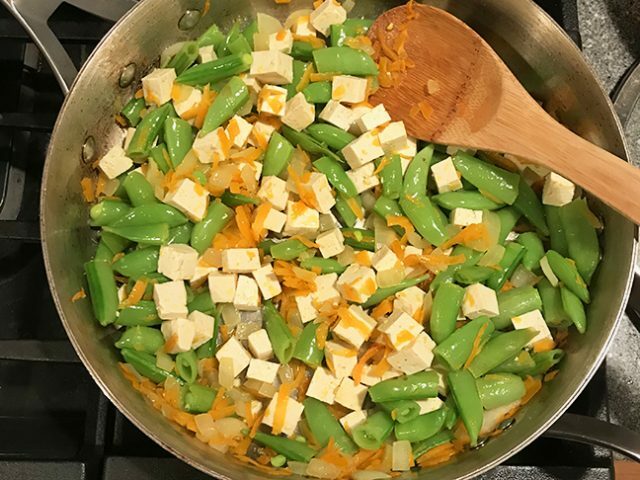 So when she spotted this tofu stir -fry, she was psyched. This dish is right up her alley. But what surprised me is that it’s up my son’s alley too. He adored this — especially the lovely, rich sauce. 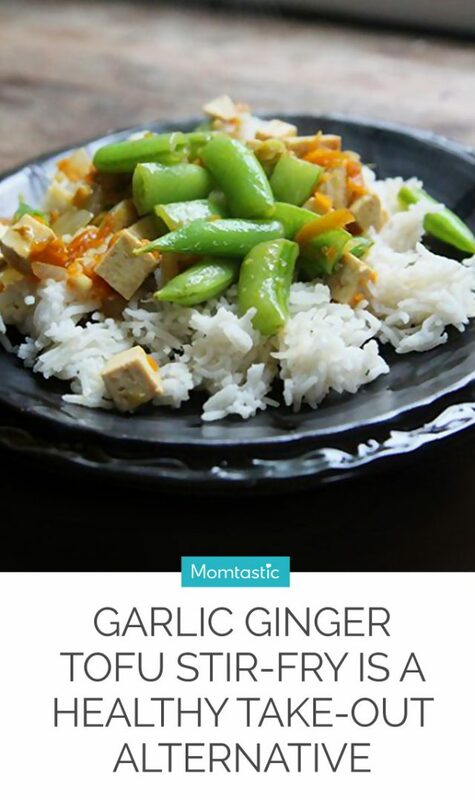 This garlic ginger tofu stir-fry makes a perfect lunch or dinner and it’s a healthy (and money saving) alternative to take-out. Crisp sugar snap peas, savoury onion, sweet carrot and totally adaptable tofu are transformed in this easy stir-fry with a rich garlic ginger sauce. 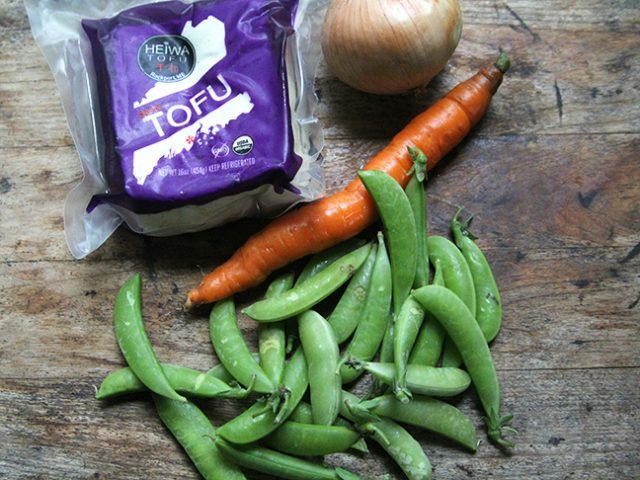 Tofu tends to soak up the flavors of whatever it’s cooked with and this is no exception. The veggies are sauteed until the onions are soft. The sugar snap peas remain crisp-tender though. Then the tofu is added to the pan and sauteed a bit — really just to warm it up. Finally, the sauce is added to the pan and allowed to cook into the tofu-veggie mixture. Mmm. That’s when the flavor magic happens. 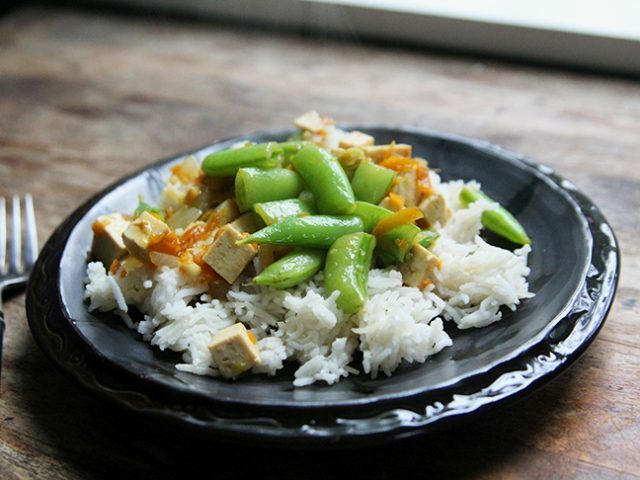 I like to serve this tofu stir-fry over rice, but it would be excellent over quinoa or farro as well. Step 1: Heat the olive oil in a large skillet set over medium heat. Add the sugar snap peas, onion and carrot to the skillet. Cook, stirring occasionally, until the onions are softened, about 8-10 minutes. Step 2: Add the tofu to the skillet and cook for an additional 3-4 minutes until the tofu is warmed. Step 3: In a small bowl, whisk together the garlic, ginger, soy sauce and light brown sugar. Pour over the tofu and vegetable mixture. Cook, stirring, for 2-3 minutes.